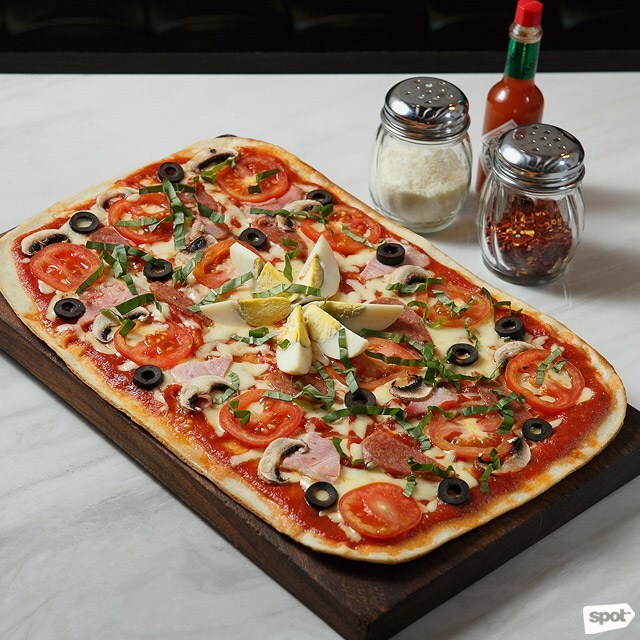 (SPOT.ph) Pizza, especially the really cheesy ones, make everything better. But how many ways can you show your love for pizza? Is it by knowing the pizza delivery hotline by heart? Or is it through celebrating the most important events of your life at your favorite pizza parlor? Don’t get us wrong; no-frills, fast-food pizza is amazing—but there’s a whole world out there that has what you’re looking for and more when it comes to making this classic Italian snack. Time to get out of your jammies and give the speed dial a break. Here’s a list of new pizza spots that might just make you want to break up with your usual. Mamma Mia wants to bring the full Italian restaurant-bar experience to the Metro. Think excellent espressos and freshly cooked pizzas by day, and funky dance music by night—just the way they do it in Rome or Milan. Staying true to the owner’s Italian roots, their recipes are as traditional as it gets. 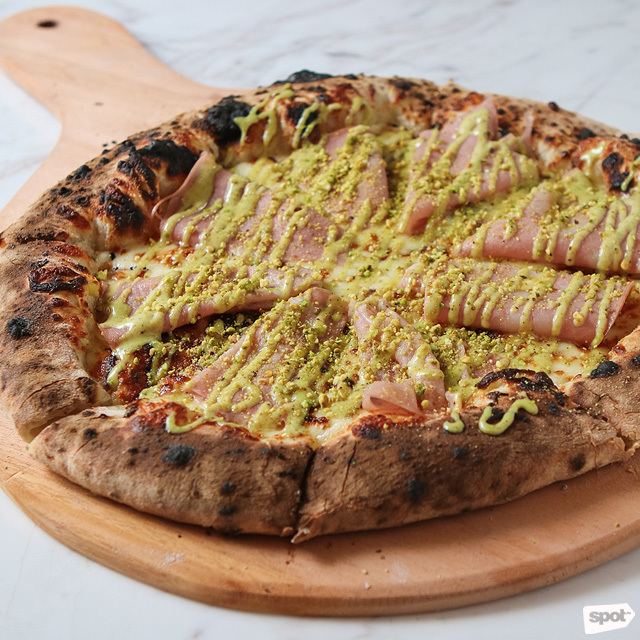 Their pizzas are also some of the best on this side of town; don’t leave without trying the Mortadella e Pistachio (P595), a Mortadella-speckled, wood-fired pizza that has four kinds of cheeses: Taleggio, mozzarella, cream cheese, and mascarpone. 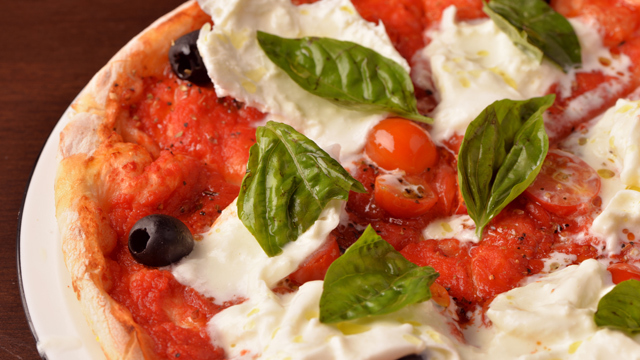 No Italian restaurant is complete without pizza. At Buca Di Beppo, a popular franchise from the U.S., their pizza sizes are much bigger than what you're used to. In fact, a “small” order of their signature Supremo Italiano (P995) can feed three to four hungry adults. It’s loaded with spicy Italian sausage, pepperoni, bell peppers, mozzarella, and provolone, as well as their tangy homemade meat sauce. Eating here is always a feast—and it’s one you shouldn’t miss! This low-key Italian joint nestled in Quezon City’s famous food district was originally known for their soul-warming pastas that come in cool take-out containers. Since they expanded their menu and space early in 2017, they started offering more comfort dishes such as Italian-style Roast Chicken and—what else—pizza. 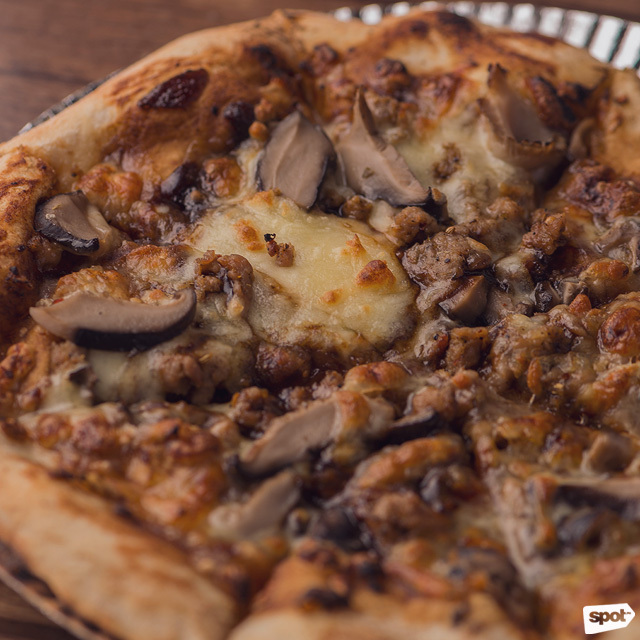 The BBQ Neapolitan Pizza (P220) is a medley of sweet and tangy flavors as the drizzled sauce is a mix of balsamic vinegar and hickory barbecue dressing. But what makes this filling meal extra special is the garlicky homemade Italian sausages on top. We swear we won’t judge if you finish this by yourself. Salta! Italian Rotisserie Chicken Bar is at 38 Mayaman Street, Teachers Village, Quezon City. Jupiter Street has had its ups and downs over the years when it comes to its food scene, but the opening of younger and trendier eateries like Persephone, Nomads BBQ + Refuge, and Whitebrass seem to have given it new life. 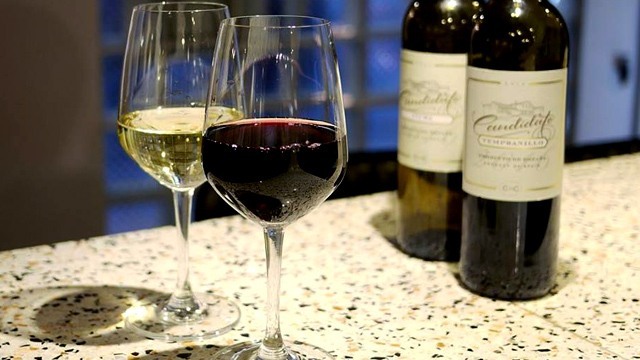 This contemporary Italian restaurant and bar specializes in dishes inspired by the Lombardy region, where the food highlights fresh ingredients and outstanding flavors. Whitebrass has their own version of the pizza, which uses focaccia bread made crunchier and flat, then garnished with just onion, tomatoes, garlic, and some good ol’ parmesan. This rendition proves that less is indeed more. Whitebrass is at 20 Jupiter Street, Bel-Air, Makati City. La Famiglia Little Italy may not be the first restaurant you’ll see once you step inside Promenade, but let your nose do the searching—the scent of their oven-baked pizzas is enough to make your mouth water and make your senses tingle. The Italian joint’s straightforward food can turn around anyone’s day, while their sizeable portions (FYI, you can get the pizza free with their pasta!) 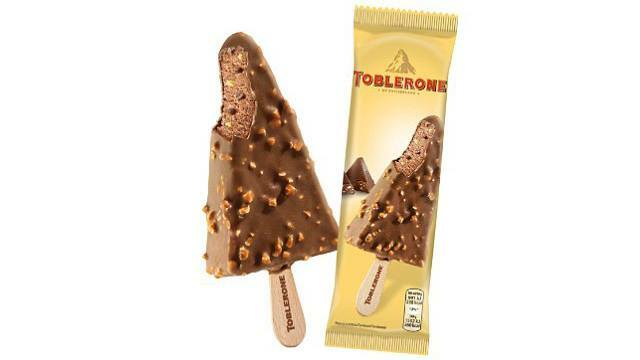 are perfect for hungry groups. Pizza before heading to the movies? The Olivia (P565) boasts exciting and contrasting flavors coming from fresh tomatoes, smoked ham, olives, pepperoni, and earthy mushrooms. La Famiglia Little Italy is at G/F Promenade, Greenhills, Ortigas Avenue, San Juan City. Don’t be fooled by their name—Flatterie’s savory dishes are anything but flat. The restaurant is the latest concept of the FOODEE group, or the people behind crowd favorites Tim Ho Wan, Pound, and Todd English. 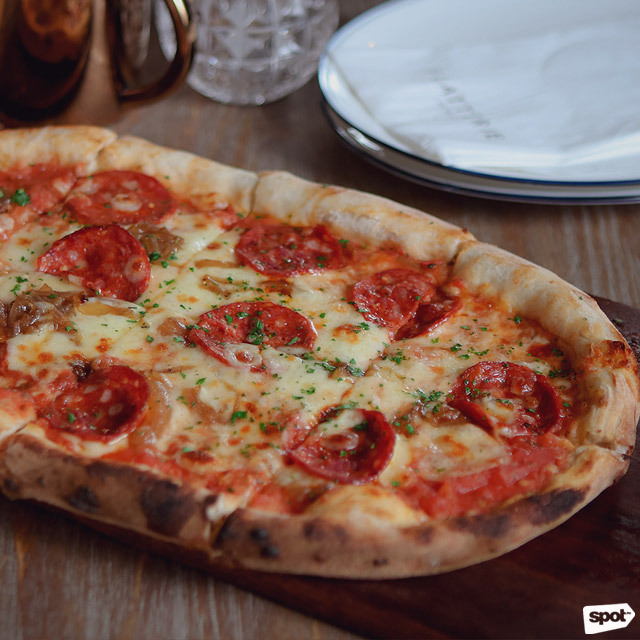 Flatterie goes for modern recreations of classic Italian meals, including the well-loved pizza, of course. Take, for example, the Indulgence (P890), a sinful flatbread pizza with steak and truffle oil. But it doesn’t stop there—a chunky slab of foie gras is laid smack in the middle amid golden deep-fried onions for, well, your indulgence. Flatterie is at G/F South Arcade, SM Mall of Asia Complex, Pasay City. It seems that PastaMania was created to be the ultimate venue for your pizza party. The Singaporean franchise flaunts a lively façade, complete with vibrant accent furniture and even more colorful food. Their pizzas are worthy of a try for its not-too-thick but chewy crust that just crackles with every bite. They come in various sizes with flavors ranging from the usual classics to more experimental takes. Pineapple lovers are welcome here, too. 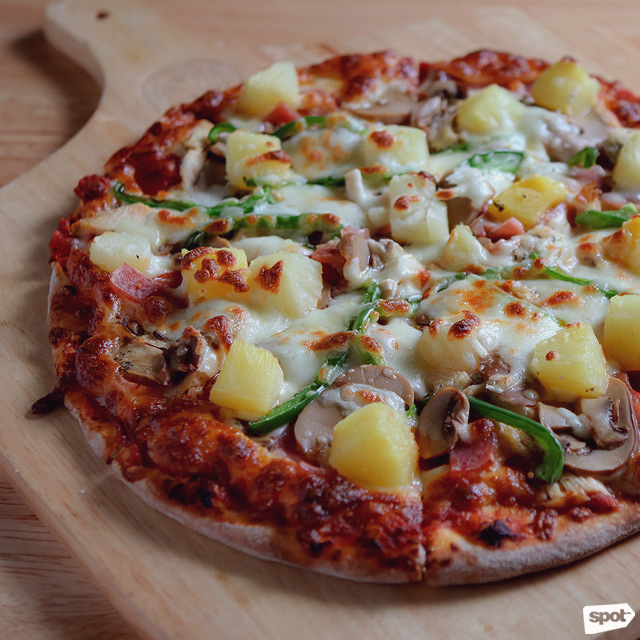 The Supreme (P260/small, P410/medium, P570/large) tastes pleasurably familiar, with creamy mozzarella, sweet ham, pepperoni mushrooms, and fresh pineapple cubes! PastaMania is at G/F SM Southmall, Las Piñas City. What once was just a popular food destination in Baguio is now a no-fail neighborhood hangout in Kapitolyo. Amare La Cucina serves up classic Italian dishes fit for all kinds of groups—from intimate dates (Fact: It’s witnessed a few proposals since it opened late in 2017) to big family and barkada gatherings. The kitchen’s centerpiece is a large brick oven where all their pizzas are baked fresh every day. 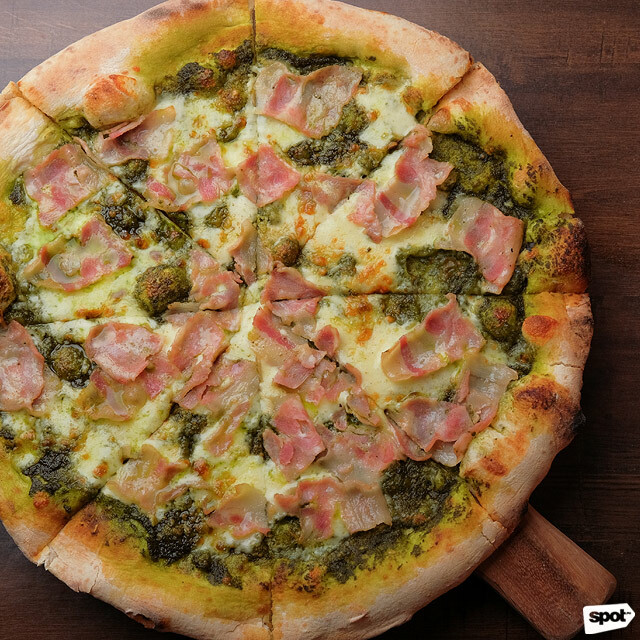 Don’t leave without trying Alvin’s Pizza (P450), a mouthwatering pizza with lots of mozzarella, parmesan, bacon, and an elegantly simple pesto base. Did we mention bacon? Giulia is a former gelato shop, rebranded and expanded so they can offer more tasty eats. Originally Casa Italia, the restaurant doesn’t scrimp on comforting meals at affordable price points, pizza included. 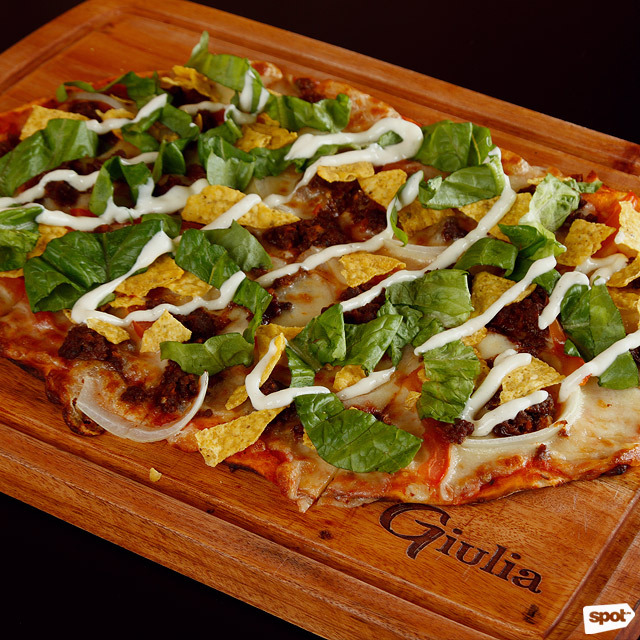 One of their best-selling dishes is their Carne Asada Pizza (P355), a light but satisfying order of thin-crust pizza topped with their signature beef sauce, fresh tomato and lettuce slices, and crunchy tortilla bits all drizzled with their tangy garlic-mayo dressing. Giulia by Casa Italia is at G/F SM North EDSA, Quezon City. This British pizza chain has been generating steady buzz since it opened in January. You’ll understand once you’ve had a piece of their flavor-laden masterpieces, like their moist baked dough balls, or their indulgent chocolate desserts. 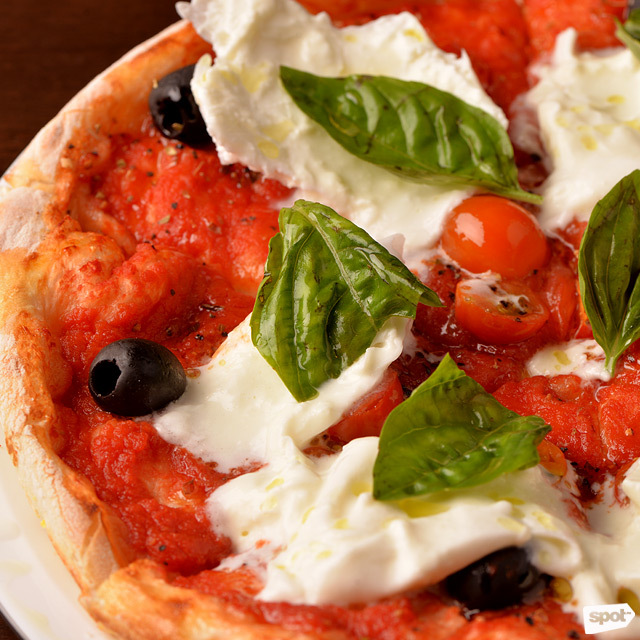 But the real star of the show is their Lava Pizza (P695), where olives, plump tomatoes, fresh basil, and generous chunks of milky burrata cheese are scattered all over a thin-crust base that’s covered with PizzaExpress’ signature tangy tomato sauce. Just thinking about it makes us want to head over there pronto! 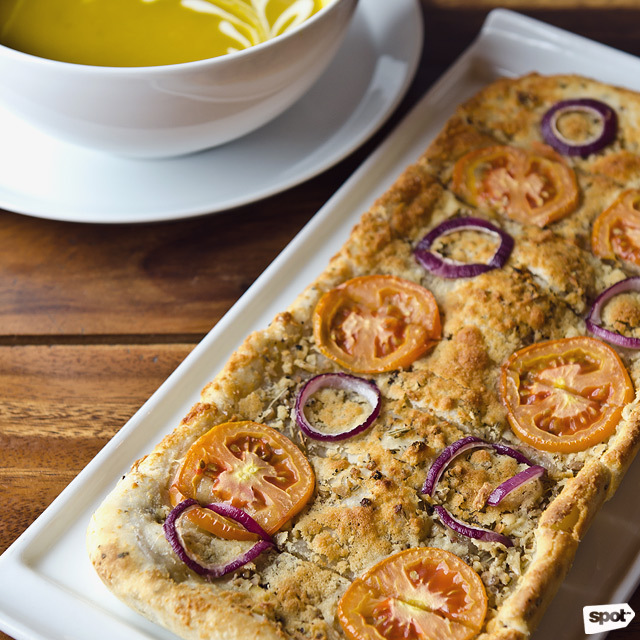 PizzaExpress is at G/F Uptown Mall, Uptown Bonifacio.